Propel a hull: make waves. There is no getting around it, sometimes literally. Let alone the injury and the damage which we may cause (and for which we are legally liable), the nuisance of other vessels' wakes is an annoyance which boaters perpetrate upon each other. Power boaters, tired of getting sloshed around, procure bigger boats, which make bigger waves. Sail boaters, themselves usually fairly innocent as wave-makers, pitch and yaw dramatically and shake their heads, if not their fists, at what they consider a lower life form. Although we want to behave responsibly, and do not condone those who do not, a wake-free boating environment is not achievable. How can we make the best of it? 1/ You want wake-producing boats as far away from you as possible. They cannot do this if you are in the middle of a channel, or if there is a gaggle of slower or smaller boats all over the place! Stay towards one side, leaving maneuvering room, of course. 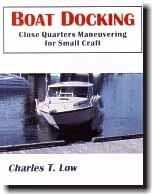 If practical, line up with other slow boats ahead of you, so faster craft do not have to weave in and out. 2/ Learn 'wake steering'. Most of us have some heavy-weather experience, and actually know what to do! Close the throttle or loosen the sheets and lose some headway. Depending on your boat's handling, take large waves just off the bow, or a bit broader off the stern. If your rudder or propeller actually leave the water, it will have been better to have started in good alignment at low speed. The really big waves generally number three or fewer, and you can resume your course and speed very soon. 3/ A power boater's speed options are limited. There is a large range of semi-planing speeds in between minimal-wake trolling and fast planing which are inefficient, mushy, and make a large wake. Longer hulls have to go faster to plane fully. So, if the offending boat slows down, the wake may get bigger. If two boats are going in the same direction, the faster boat may be better to plane by quickly than to mush by awkwardly. If she comes completely off plane, and converts to 'displacement' mode, she may be going so slowly that she'll never get by! 4/ Also, understand the difficulties of getting larger boats up onto a plane. It requires tremendous energy, and then they often have to retune twin engines, trim tabs, and outdrives. Rightly or wrongly, they simply are not going to do this for every boat they pass. 5/ Trim the power boat properly. Use outdrive trim, planing trim tabs and weight distribution to keep the bow down. This usually produces less wake. 6/ When it is appropriate to come off plane, do so. If in doubt, slow down, whether everybody else does or not. But then come right off to a slow, small-wake speed. You can often move along fairly briskly this way, although it seems slower because the engines aren't labouring and the water stays calmer (and everybody is happier). See also my article on Mushing. 1/ In a smaller bay you likely will enjoy excellent wave shelter, and probably good wind shelter too. 2/ Your 'working' anchor may, in fact, be rated for storm conditions, for your boat. It gives you an extra margin of safety. A storm anchor, for small craft, still is quite small and manageable. 3/ You may use some chain. An all-chain rode's suggested maximum scope is sometimes quoted as only three to one. Even two or six metres of chain on your anchor helps considerably. Some authorities suggest a length of chain equal to your boat length. 4/ You have learned how to set your anchor well. You certainly do not want it fouled with weeds or with a ball of muck. Don't pull back on the rode too hard, too soon. Let it settle in for a few minutes before tugging very firmly on the line. In thick grass, if you cannot find a bare spot, try to let it drop straight down, and then leave the line slack whilst you reverse or fall back in the wind. Take careful bearings, and then check them once in a while! There is no harm in making several attempts to set the hook well, whereas there is in setting it poorly, once. 5/ You use an appropriate rode material, strong but stretchy. Nylon, twisted not braided, is an excellent, inexpensive choice, and you can safely use a bit smaller diameter, for greater elasticity, than one would think. For overnighting in a sheltered, crowded anchorage, if the expected winds are under twenty knots, I often use a scope of four to one, with a storm anchor and some chain. Less than that still feels uncomfortable, unless the bearings are under constant observation.